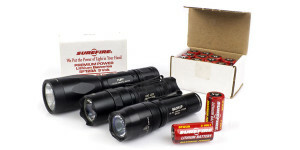 The SureFire E2LAA-A Outdoorsman has a MSRP of $250. The E2LAA-A features aerospace aluminum construction with a Mil-spec hard anodized finish and plentiful knurling. The body and tail are unchanged from previous versions with the only difference being the new head assembly. The attached steel carry clip allows the E2LAA-A to be securely carried in a bezel-up position in a pocket or clipped to a pack. It also permits hands-free use when clipped to the brim of a hat or cap and provides a lanyard attachment point. The E2LAA-A features a completely redesigned head with a spring contact for the positive battery terminal. Designated as the KE1B, the E2LAA-A head shares the same outward appearance and 22mm optic as the KE1 and KE2 heads found on the E1L-A and E2L-A respectively. The E2LAA-A comes equipped with Energizer Ultimate Lithium primary batteries installed and can be easily disassembled into its main component parts (head, body, and tail cap). These parts are interchangeable with those from earlier E-series lights. 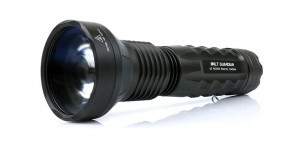 Owing to its 2xAA design the E2LAA-A is longer than the other Outdoorsman series lights, measuring 6.8 inches in length. This length, combined with the body and tailcap knurling, allows for a very secure hold on the light in both under and overhand grips. (Edit 9/30/2013) – SureFire catalogs from 2010-2012 list the weight of the E2LAA as 4.9 ounces (139 grams). The weight shown above is based upon weighing my one sample with Energizer Lithium batteries installed. The E2LAA-A produces a beam with a center hotspot that is bright enough to easily identify items over 60 yards away. The spill beam is very broad, although much less intense, allowing for good peripheral vision out to around 20 yards. The beam has a slightly cool tint with a bit of a greenish hue to the corona around the hotspot. 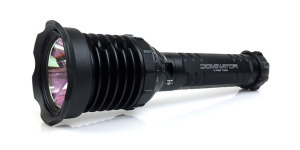 As with other recent SureFire TIR equipped lights such as the EB1 and E1L-A, the E2LAA-A beam has a smoother transition between the hotspot and spill and has less obvious rings than previous TIR-equipped lights. Some rings are visible when the beam is projected onto a flat surface from close range but are not noticeable in general usage. Although the E2LAA-A uses the same TIR optic as the new E2L-A and has roughly the same output, the E2LAA-A has a tighter center hotspot due to its smaller LED. 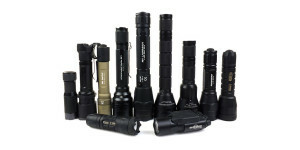 In the following photos, the beam of the E2LA-A is compared to a selection of other lights at different distances. 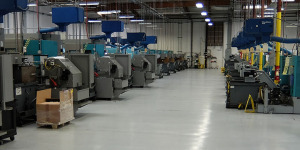 The beams can be compared across the full width of the image using the slider, while additional images can be accessed by using the navigation buttons in the bottom-right corner. The E2LAA-A is designed to provide long runtimes regardless of battery choice. Tests were conducted using Energizer Ultimate lithium batteries as well as Sanyo Eneloop rechargeable and Energizer MAX alkaline batteries. The extended runtime is achieved, in part, by a step-down in output after the E2LAA-A has been on for 2 minutes. The amount of step-down varied slightly by battery type with outputs ranging from 75-80% of the initial output. Like the E1L-A, the E2LAA-A can be returned to full output by switching the light off and cycling back to high mode again. With the reduction in output, the E2L-AA was able to provide stable output for 8 hours 34 minutes on Energizer Ultimate Lithiums, 4 hours 38 minutes on Sanyo Eneloops, and just over 3 hours with Energizer MAX alkalines. With all battery types the E2LAA-A continued to produce decreasing amounts of light for a considerable time. When compared to the previous version of the E2LAA, equipped with the KX1B head, the new E2LAA-A demonstrates improved efficiency and manages to offer increases in both output and runtime. Over the course of the runtime testing, the head and body of the E2LAA-A remained cool with its highest measured temperature being 6 degrees Fahrenheit above ambient (83 degrees). The E2LAA-A Outdoorsman is not going to impress people based upon its sheer output nor is it meant to do so. It does what it is designed to do very well which is produce a steady and consistent amount of light for an extended length of time. The ability to use a variety of primary and rechargeable batteries makes the E2LAA-A even more versatile, allowing owners to use what is available rather than relying upon one type of battery. I consider the timed step-down in output after 2 minutes operation as a good trade-off for the extended runtime. Although the E2LAA-A is still a 2 mode light, this reduced output level is almost like a “hidden” medium mode that some have wished for over the years. The 2xAA body of the E2LAA-A is considerably longer than what I normally carry on an every day basis and is longer than what I can comfortably pocket carry. However, its slim design makes it extremely easy to carry in (or clipped to) a pack or bag. When in use the extra length is a benefit as it combines with the knurled finish to provide an extremely secure grip. As with the other new members of the Outdoorsman family, the E2LAA-A has a very useful beam. The hotspot provides plenty of reach and I have come to appreciate the increased spill and smoother beams from the latest generation of TIR optics. The E2LAA-A Outdoorsman is compatible with SureFire’s new F04-A Diffuser, F05-A Red Filter, and F06-A Blue Filter. 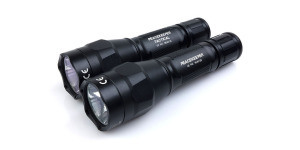 Visit their mini-review to see more about these attachments as well as beamshots when used with the E2LAA-A. The slight bit of green in the beam may be a turn-off for some users. In my use, it has not been noticeable (and is much better than some other new lights), but it is not a pure snowy white. Additional information about the E2LAA-A can be found on the SureFire website. Share your thoughts or questions in the comments section below or head over to CandlepowerForums and join the discussion there. But I wonder: according to your review the 80lm E2L AA provides slightly shorter stable runtime than the successor. My experience is another, however: I measured 9,5 hours with Energizer lithiums. Also I recall that another user presented similar result, close to 10 hours. I don’t know if there may be a slight brightness difference between different examples of the same light, perhaps your E2L AA is slightly brighter than mine? Hi Swedpat, good to see you posting. I have seen tests which returned results, like you described for your E2LAA, where it far exceeded its advertised runtime, 9 hours until output drops below 1 lumen, but I can only comment on the one I have tested. This was a brand new E2LAA and is likely among the last produced before the introduction of the E2LAA-A. Based upon my single test of this light, it stayed in regulation for a shorter length of time than earlier tests but I would say it still met it’s advertised runtime (to below one lumen) as it was still producing a decent amount of light even after 10 hours (not shown on the chart above). Whether the difference is because it is brighter or because of something else, I can’t say as I don’t have another to compare it to. On a related note (this has nothing to do with your observations), the runtimes for the E2LAA and E2LAA-A are specified slightly differently. As already mentioned, the E2LAA was rated for 9 hours until output dropped below 1 lumen while the E2LAA-A is rated at 8.5 hours until output drops below 10%. The E2LAA-A also continued to produce a usable level of light for quite a while after that so it’s time to below 1 lumen would have been even longer. what would happen if you put this head on an e1l body? since it is 3 volts would you still get the same runtime and output? Hi Tony, the KE1B should work on the E1L but I haven’t tested that configuration. I would expect it to have higher output but shorter runtime when compared to the KE1 head. I’m trying to figure out which surefire to go with, the EB1, the E1l or this AA version. they all have pros and cons, which would you personally recommend. This light will be used for general use, I just fear the AA version would only get used for camping or remain in my pack as the other two are eligible for EDC.